Automotive catalytic converters (ACCs) play a vital role in the exhaust system to lessen the emission of dangerous pollutants, such as hydrocarbons (HC), carbon monoxide (CO), and nitrogen oxides (NOx). A converter normally contains a so-called honeycomb substrate. This kind of structure comprises of many fine channels resembling honeycombs created by honeybees in nature. Most of the ACCs are ceramic based and consist of a like substrate composed of cordierite (2MgO.2Al2O3.5SiO2). This material is wash-coated with alumina (Al2O3) to which a combination of platinum group metals (Pd, Pt, Rh) and rare earth oxides such as ZrO2, CeO2, and so on is added. Recovery of precious metals by recycling used-up ACCs signifies a considerable economic value. Energy-Dispersive X-ray Fluorescence (EDXRF) delivers a fast and accurate determination of Pd, Pt, and Rh content in used-up ACCs. At the microscopic level, ACCs are inhomogeneous and require detailed sample preparation before reproducible analysis is achievable. The primary step comprises of grinding the material using a ring and puck mill or vibratory disk. It is useful to monitor element characteristic line intensities as a function of grinding time and to assure that these have realized a constant value. This should be analyzed for the precious metals as well as for the presence of other elements (i.e. Al, Ce, Zr, etc.). Grinding sets composed of tungsten carbide (WC) should be avoided as sample contamination by tungsten will lead to characteristic lines of tungsten intruding with the lines of platinum. After grinding, the powders can be pushed into a pellet with the help of a binder. Akin to geological samples, the inhomogeneous nature of ACC will still result in mineralogical effects. To evade these, certain laboratories choose to fuse the sample but this causes other problems related to the instability of precious metal oxides and their propensity to agglomerate or alloy with Pt/Au crucibles. For this article, Thermo Scientific chose to prepare pressed samples of 32 mm diameter using an automatic press applying 20 tons of pressure for 15 seconds. The Thermo Scientific™ ARL™ QUANT’X Spectrometer is fitted with a large-area (30 mm2) Silicon Drift Detector (SDD) offering exceptional sensitivity for precious metals. Table 1 offers the detection limits acquired for Pd, Rh, and Pt in a standard ACC matrix. Table 1. Typical ARL QUANT’X Spectrometer minimum detection limits for Rh, Pd, and Pt in an ACC matrix. As stated, ACCs are relatively complex samples and necessitate a large set of calibration standards to make up for the difference in composition for this material. Although ideal, such a set of standards is not available at all times or the standards are not entirely characterized, which makes a precise estimation of inter-element effects difficult. This article proposes an alternative based on standardless fundamental factors. Sample composition has been established using Thermo Scientific UniQuant, a standardless fundamental parameters program recognized for WDXRF and currently also available for EDXRF. The UniQuant program is offered pre-calibrated using a set of pure elements and compounds and will rectify not only matrix effects but also spectral intrusions. It utilizes eight principal beam filters provided with the ARL QUANT’X Spectrometer and preset voltage settings to create the ideal possible profile of any unidentified sample without optimization or user intervention. A full analysis requires just 10 minutes per sample and returns the whole sample composition. A set of 10 ACC samples has been tested to establish Pd, Rh, and Pt concentrations autonomously using ICP-OES and EDXRF integrated with UniQuant. Figures 1 to 3 illustrate the outcomes of this study. A good agreement is achieved between both methods with average relative differences of less than 3%. Despite the intrinsic heterogeneity of the samples and ambiguity in results, this is very satisfactory. Figures 1, 2, and 3 illustrate comparisons of ACC analysis results acquired using ICP-OES and the ARL QUANT’X EDXRF Spectrometer combined with UniQuant standardless FP software. 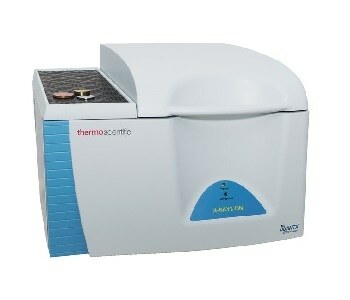 To establish the instrument repeatability of this technique, Thermo Scientific has repeatedly examined a catalyst sample 11 times in a row. In between measurements, the sample was removed from the sample holder and re-positioned again. The measurement time was fixed to 30 seconds for the conditions concerning the elements of interest. Table 2 gives the test results. The average relative standard deviation at 1 sigma was 2% or less. The ARL QUANT’X Spectrometer along with the UniQuant software is used to examine automotive catalytic converters (ACCs) to establish Pd, Rh, and Pt content. A blend of EDXRF with UniQuant standardless fundamental parameters yields outcomes that demonstrate good agreement with those attained via ICP-OES.